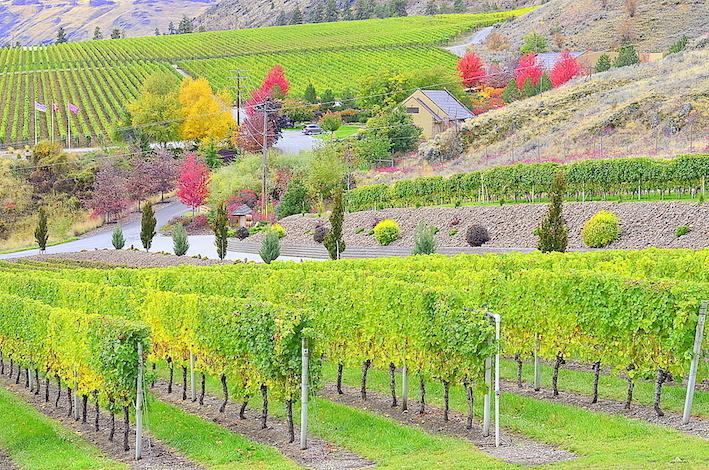 OLIVER, British Columbia — If you’re science-minded, iconoclastic and love good wine, then Gehringer Brothers Estate Winery in British Columbia’s Okanagan Valley should be a destination. 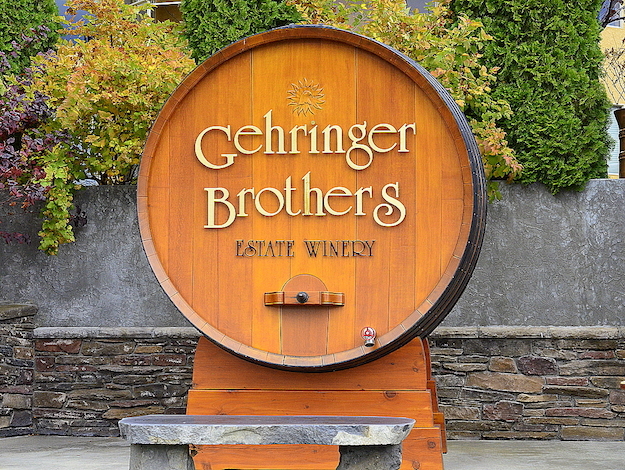 On the one hand, Gehringer Brothers has won so many awards and medals that there’s no longer room to display new ones on the walls of its tasting room on the Golden Mile Bench. 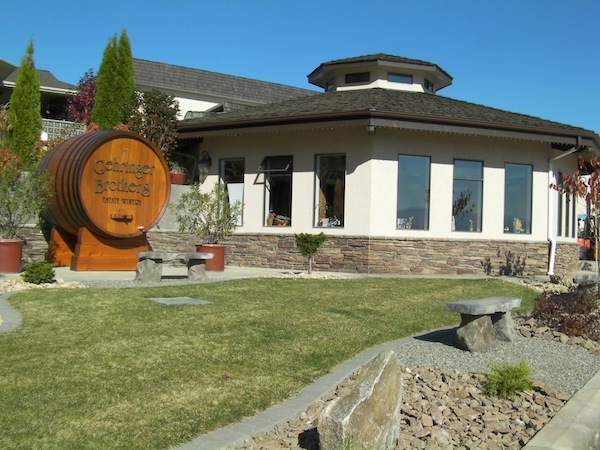 This family owned and operated winery wears the crown as “King of the Platinum” as a result of Wine Press Northwest magazine’s annual Platinum Judging that determines the best of the best of wines from the Pacific Northwest. 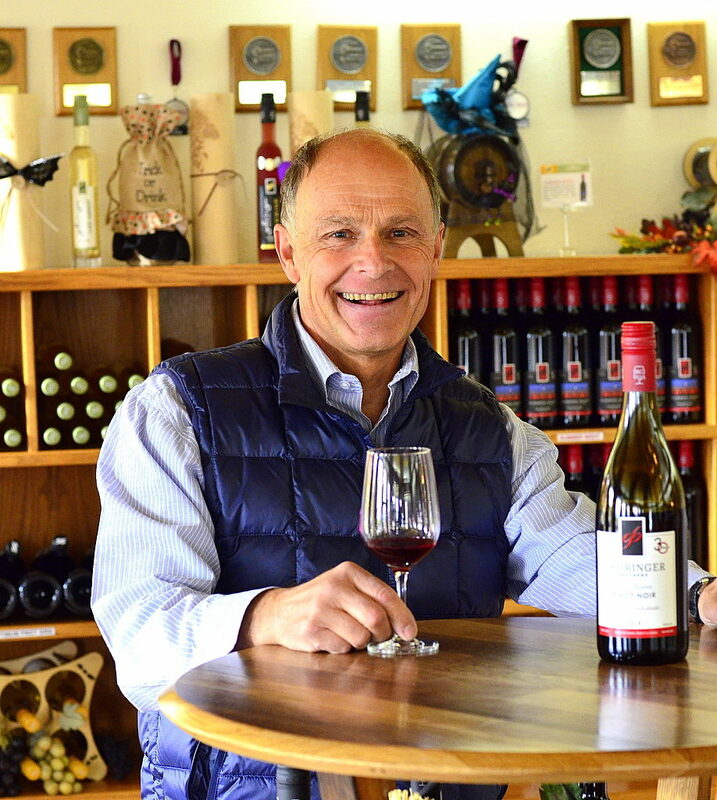 Gehringer has won more than 60 Platinum awards at the highly competitive judging, more by far than any other Pacific Northwest winery. And yet, the only barrels at the winery sit outside as mere decoration the entryway. Modern winemaking techniques, such as micro-oxygenation, are used at every step of the wines’ development, but wherever you fall on the spectrum of tradition vs. technology, what’s indisputable is that Gehringer Brothers wines are astonishingly delicious and sell for a song. Brothers Walter and Gordon Gehringer are a blend of Old and New World, of German ancestry but born in British Columbia. After high school, in 1973 Walter embarked on a six-year education in Germany to follow his dream of studying at Geisenheim University in the Rheingau region. He spent two years there working to prepare for entrance to the Enology and Viticulture program, then three years at the university, followed by a year filled with a succession of five-week practical experiences at different wineries. His brother Gordon spent four years in Germany and graduated with a degree from the State College and Research Institute for Viticulture and Horticulture in Weinsberg. Today, the pair run the 25,000-case winery on a steep hillside in Oliver, British Columbia, making 20 different wines every year. 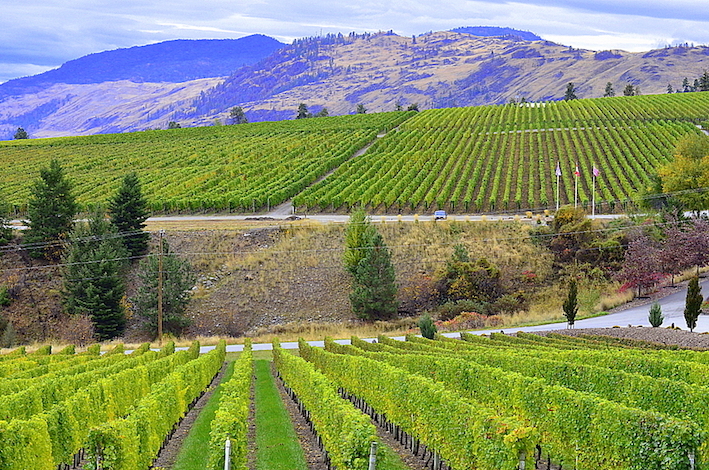 They are in the first and only sub-appellation in the Okanagan Valley, established last year, called the Golden Mile Bench, at an elevation of 1,670 feet. 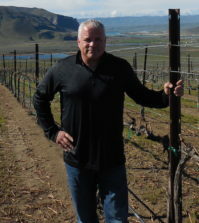 Gehringer started in 1981 when the brothers bought the land where their vineyards and winery now stand, and began an arduous effort to plant grape vines. Arduous, even Herculean, because at some time in geologic history, a huge deposit of glacial sandy loam slid off the slopes above his property, carrying with it vast amounts of rock rubble. It all came crashing down on what are now his vineyards. Initially optimistic, in order to begin planting they brought in a tractor to dig the rocks out of the soil. Soon, however, they realized that there was literally a vein of rock running through the land. It turned out that they were forced to remove a three foot deep layer of pure rock, dropping the elevation of the whole soil profile about three feet. Proceeding at the rate of an acre or so per year, the estate vineyards now cover 45 acres. Those acres are planted with thriving Riesling, Chardonnay, Pinot Gris, Ehrenfelser, Schönburger, Gewürztraminer, Sauvignon Blanc, Auxerrois, Pinot Noir, Cabernet Franc, Merlot and Cabernet Sauvignon. Digging out a three-foot layer of rocks one acre at a time wasn’t the end of their travails. They also have soil problems to contend with, and so they water all of their vines with overhead sprinklers, a technique not much used in this age of nearly ubiquitous drip irrigation. Overhead irrigation gives Gehringer the ability to grow grass between the rows, and their goal is to grow a grass that has a root system as deep as the vines’ roots, like a tall fescue. That way when the roots of the grasses decay each season they provide organic matter right down in the root zone, where it’s needed. The analogy Walter uses is vivid. “You can keep prisoners on a bread-and-water diet and it will keep them alive, but an Olympic athlete needs a very different diet. So in a vineyard, the bread-and-water diet would be just water and nitrogen, and I will get a crop, I will get sugar and alcohol, and I will get a glass of wine. But I’m trying to raise an Olympic athlete in that glass of wine and that means that the root system of the vine has to have access to every building block, to build that flavor profile. And then there was extensive testing, years of trial plots and careful records, to determine which grapes were best suited to their vineyards. Walter Gehringer, meet Walter Clore. In the late 1970s, while Gehringer was still a student at Geisenheim, the Enological Society of the Pacific Northwest invited Dr. Helmut Becker of the Geisenheim Grape Breeding Institute to speak in Seattle. 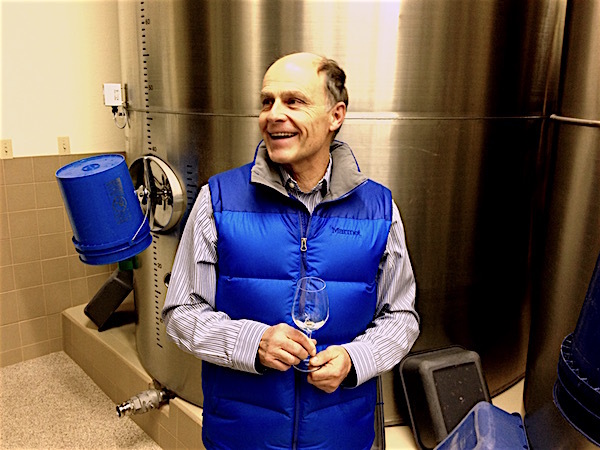 Gehringer wangled an invitation to drive Becker to Prosser to meet Dr. Walter Clore, widely considered to be the father of the Washington wine industry, whose viticultural research focused on the challenges of growing European wine grapes in the Pacific Northwest. 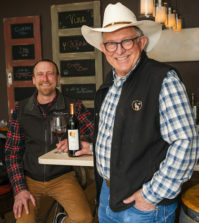 They drove back to Seattle via the Okanagan Valley, a rather considerable detour, in order to get Becker’s advice about planting the Gehringer vineyards. This meeting of great minds resulted in the creation of two test plots of 60 grape varieties, one near Oliver, and one farther north in Kelowna, where the climate is much colder. These experimental plots revealed that the grape best adapted to Gehringer’s needs was Auxerrois, a grape grown extensively in Alsace. Proving the worth of that research, today Gehringer’s Auxerrois is a model of a multi-layered wine with a refreshing snap and a subtle bouquet, quite unlike any other wine known in the region. 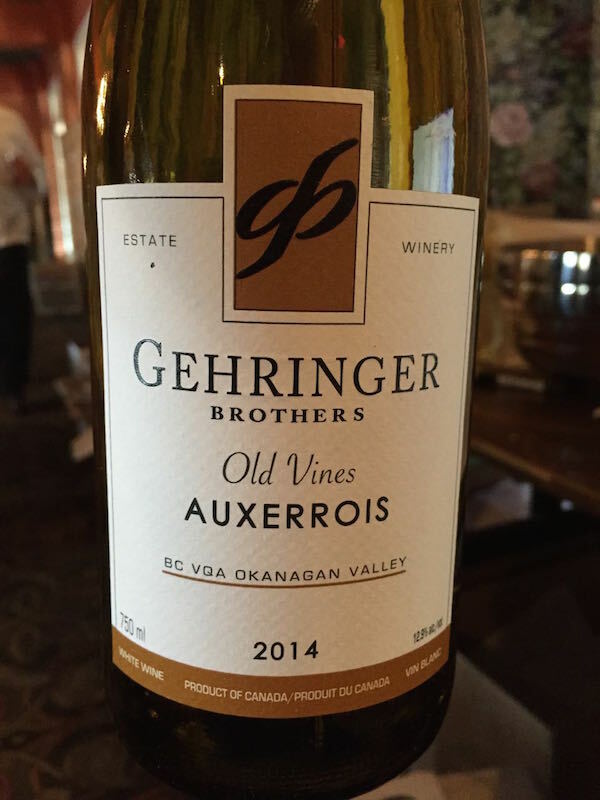 And the Gehringer Brothers 2014 Old Vines Auxerrois won best of show at the 2015 Great Northwest Invitational Wine Competition, a judging of West Coast wine influentials. Science has paid off for the Gehringer brothers in their vineyard, and it rules their winery as well. Their wines are made in huge stainless steel tanks ranging from 5,000 to 15,000 liters. They run their own bottling line, a state-of-the-art line that seals all of their wines under screw tops. They don’t use barrels, even for their red wines. They bottle all of their wines in March and April of every year, and they’re bottling the current vintages. And here’s where the debate comes in. A winery without barrels or corks flies in the face of tradition and a wine lover’s romantic vision. 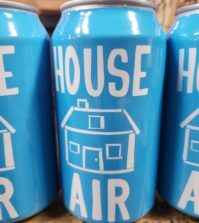 To Walter Gehringer, it’s clear-cut: it’s all about breathing. The new generation of screw tops breathe exactly like a cork, they’re engineered for that. And as for barrels, he sees them as an anachronism. Answering his own question, he comes down squarely on the side of micro-oxygenation. Since the film Mondovino, micro-ox, as it’s known, has had a bad rap. 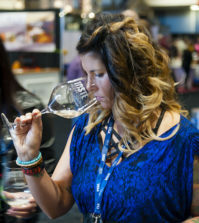 It’s a technique that’s responsible for the “drink it now” style of wine that is slowly edging out winemaking aimed at wines that are intended to be aged. Some winemakers and collectors view it as mechanization that’s replacing the art of making serious wine. 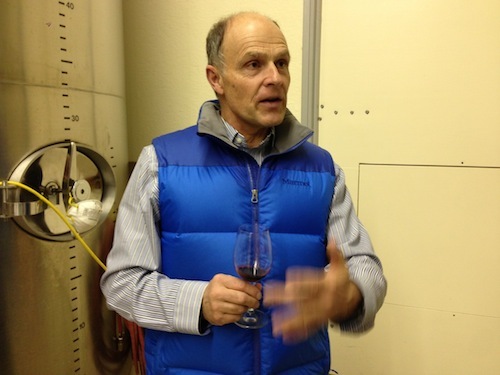 To emphasize the effectiveness of his “drink it now” approach, he pours a 2014 Pinot Noir and one straight from the tank, only 30 days after it was pressed. The wine is not quite finished going through malolactic fermentation, and if made by more traditional means it would be spending a couple of years in a barrel before it would be ready to drink. Stunningly, the two wines taste almost identical, the new wine tastes really well-developed, even in its infancy. Is the Gehringer winemaking approach heresy or a brilliant use of science in the service of art? Judges all over the Pacific Northwest agree, these are some of the most enjoyable wines on the market today. And that’s the paradox of Gehringer. Your experience with other wines and winemaking styles may well conflict with what your nose knows, what your palate whispers. The trick is to get out of the way and let the Gehringer wines speak for themselves. Let science steal your heart.